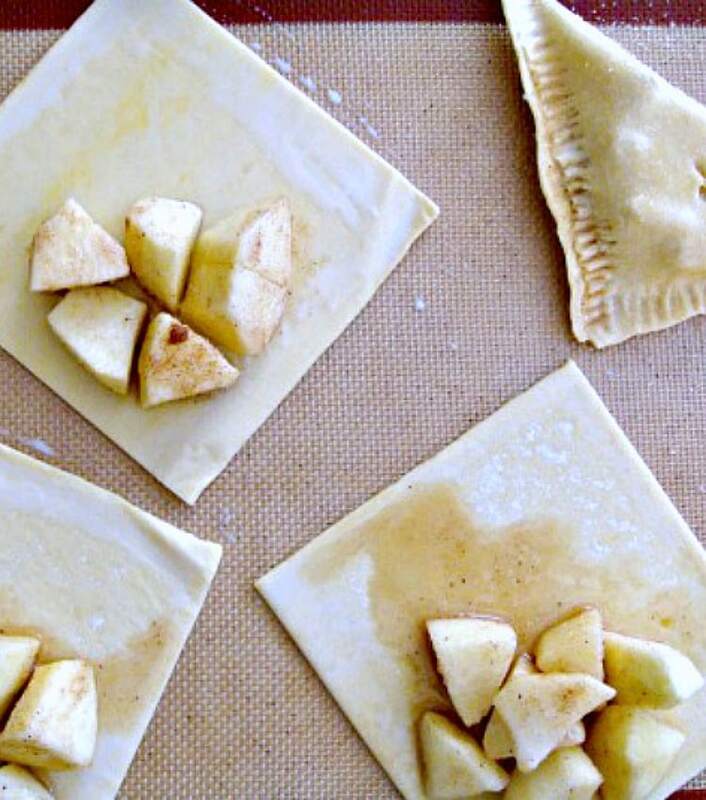 EASY APPLE SPICED TURNOVERS.. Delicious warm from the oven! Crispy puff pastry packed with apples coated in cinnamon. Delicious eaten warm or chilled with a blob of ice cream too! Easy recipe, budget friendly and freezable. 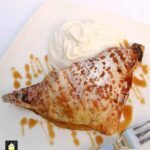 Easy Apple Spiced Turnovers! Oh boy! We’ve got a really easy recipe for you today and great tasting too! Everybody knows what an apple turnover is, and this recipe shows you how to make them. They are certainly very delicious with the spices coming through and the crispy pastry. When these are being prepared and then baked in the oven, the aromas! You get a wonderful feeling of Fall and Christmas! It’s fabulous! The combination of cinnamon together with the nutmeg gives a more gentle flavor. I often find when using cinnamon, it can be quite a harsh strong and over powering flavor, so the nutmeg ‘softens’ it a little. it’s really quite nice! They look lovely on a plate at a party, or great to have at a picnic or in a lunch box, or if you’re like me, you will eat them as soon as they come out of the oven, burning your tongue as you take a bite! 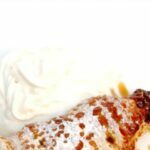 I like to eat my easy apple spiced turnovers with a blob of whipped cream, some like to add ice cream, and some like to eat them just as they are! The choice is up to you! As for the pastry, I make my own, but of course you can buy ready made pastry. In this recipe, I have made my own pastry, from my flaky pastry recipe. However, I have tried making these using shop bought Puff Pastry and it works well. So you have options to make or to buy! 8 oz or 225 g Flaky or Puff Pastry. 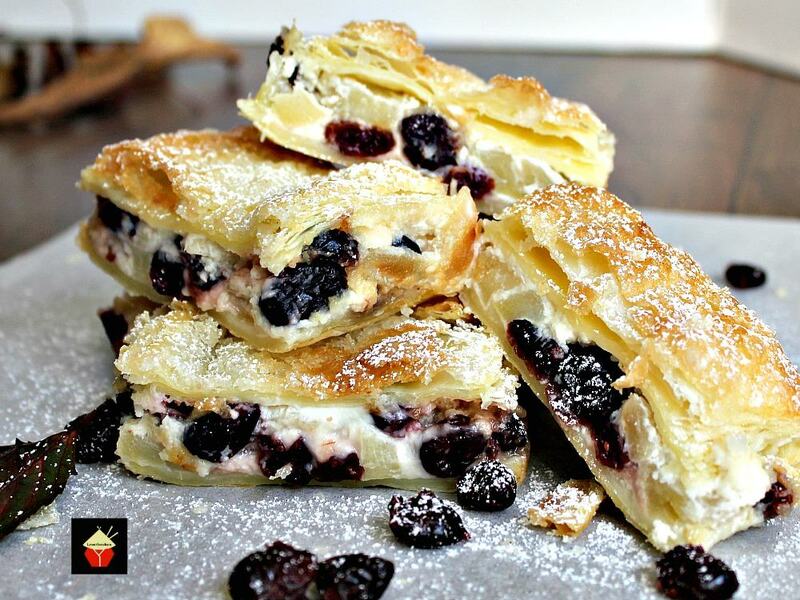 See here to make your own Flaky pastry. You can also add some raisins, cranberries, ground cloves, whatever you fancy! 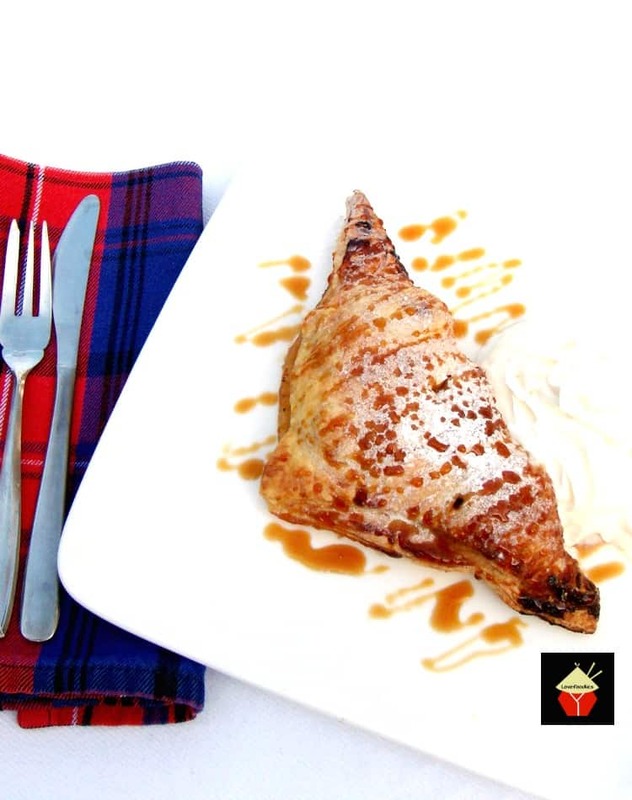 Make the turnovers to suit your taste. 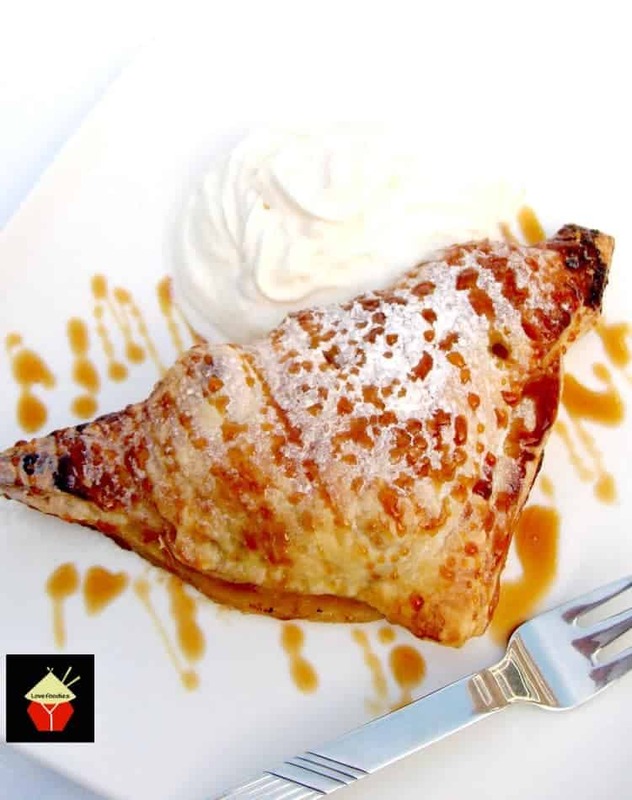 Chopped pears are also very delicious in turnovers. 1. First, if you are making your own pastry, do that and let it rest in the fridge for 30 minutes. 2. Prepare all the ingredients. Peel and chop the apples into small pieces,, and add to a bowl. Then squeeze some lemon juice over the apples, to stop them going brown. 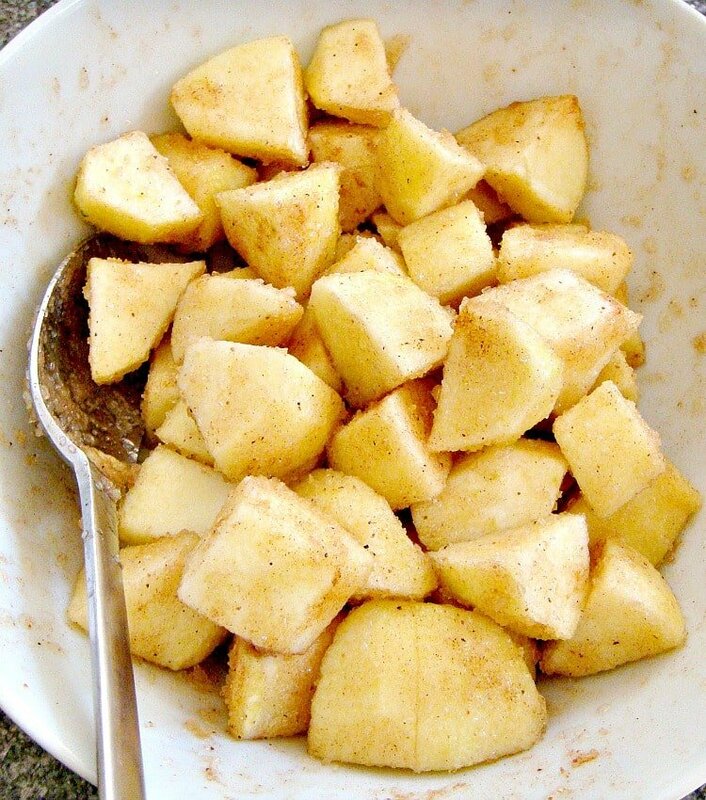 Add the sugar, nutmeg and cinnamon and give it a good stir so all the apples are coated. 3. Get your flaky pastry out of the fridge, roll the pastry out until 3-4 mm in thickness. You want to be able to cut roughly 12-14 pieces of 3 inch squares from your pastry. 5. Brush all over with milk and sprinkle a little of the sugar over the tops. 6. Place in the oven for 15 – 20 minutes. or until golden brown. When done, place on a cooling rack and eat when warm. They are nicer just warm than Piping hot! 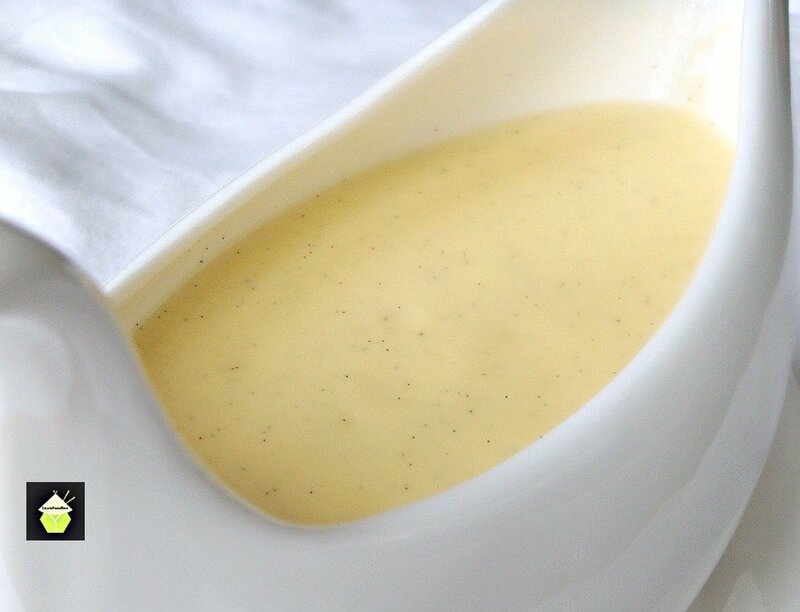 If you’d like to make your own Homemade Custard to go with this, you will love it! The combination is delicious! 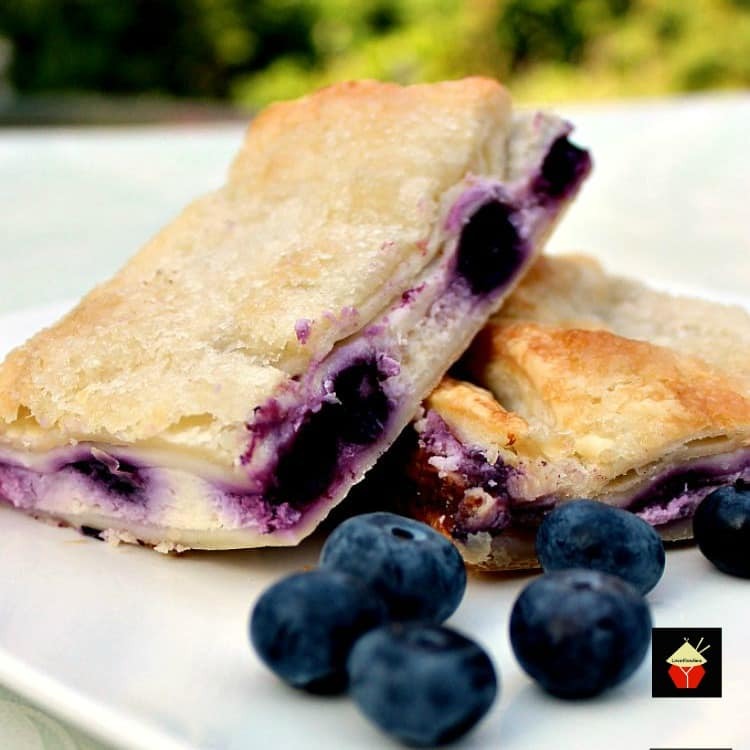 You might also enjoy our Blueberry Crescent Roll Cheesecake Bars. Another really easy recipe and always a family favorite! 8 oz or 225 g Frozen Puff or Flaky Pastry pack. First, if you are making your own pastry, do that and let it rest in the fridge for 30 minutes. Prepare all the ingredients. Peel and chop the apples into small pieces,, and add to a bowl. Then squeeze some lemon juice over the apples, to stop them going brown. Add the sugar, nutmeg and cinnamon and give it a good stir so all the apples are coated. Get your flaky pastry out of the fridge, roll the pastry out until 3-4 mm in thickness. You want to be able to cut roughly 12-14 pieces of 3 inch squares from your pastry. Brush all over with milk and sprinkle a little of the sugar over the tops. Place in the oven for 15 - 20 minutes. or until golden brown.